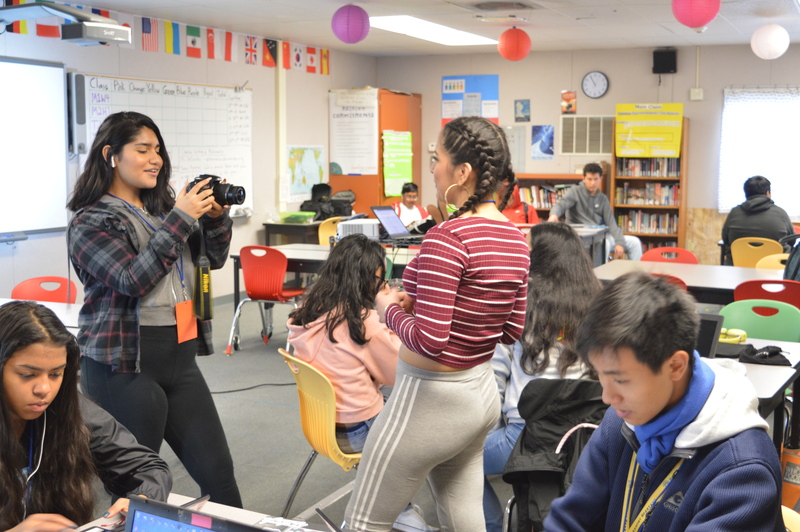 Estrella Esparza-Johnson teaches an advanced course in Modern Acting and an Introduction to Dramatic Arts course for the Expeditions team at Summit Public Schools. Estrella Esparza-Johnson teaches acting courses for Summit’s Expeditions team. How long have you been a teacher of the arts? What inspired you to pursue the arts? What inspired you to become a teacher of the arts? “Our kids really need it … I started to see that drama and the skills that it develops are good for intrapersonal communication, development of language and vocabulary, confidence, public speaking, media literacy, critical analysis, critical thinking, and just, a place for kids to be creative, that, at that time, this was back in, I wanna say, 2000 like 4 or 5 and 6, there was the No Child Left Behind thing so kids were just being taught to test, test, test, test, and having very few experiences where they got to explore more parts of being human. I saw my ability to come in as a teaching artist with drama to help them enhance their skills, especially students who were immigrant students, learning English – the drama was a way to bridge their home understanding and where they were coming from and give them a means to express themselves and make a level playing field to students who adapted the language, where they could contribute. What do you think is the importance of art programs in schools? “There’s been this artificial wall built between science and math and then the arts. Science and math have been seen as incredibly important, which they are, and you know, I encourage people to explore those fields of human study. But you have whole generations of people who have been brought up to believe that the arts are less, not as important than science and math, when the reality is, if you study science and math at the college level and the arts, what you find is that they’re so much the same. We’re all adept at exploring the unknown. We’re comfortable in not knowing, in experimentation, observation, theorizing, critically analyzing things, innovating, challenging boundaries, looking at things from alternate perspectives. So I think that all human beings need to be exposed to those modes of behaving and thinking and practicing, because in a scientific laboratory, you know, you follow the scientific method. You theorize, you observe, you experiment, you reflect, you go back, and eventually you come up with empirical evidence. You do the same, or a very similar process when it comes to improvisation, or playwriting, or developing a scene, or developing a monologue, learning how to develop the voice. In your experience, what do students take from these programs? “When you study something, say economics, part of economics study is the study of game theory, which is, you know, setting up games. Here’s a set of circumstances, here’s an objective, work within it to accomplish the objective. That’s exactly what we do in drama. What value do you see in art programs in an education system? “I had a theater professor, a drama professor who cited the neurological reality that if the brain, when asleep, and it is regenerating, if it does not have rapid eye movement, dream sleep, the brain loses its ability for cognition, its ability to be sane and to function. Therefore, this professor, Michael Fields, extrapolated that we as artists are the dreamers of society. If we stop dreaming, thinking the thoughts and doing the expressions that we do, then society itself will lose itself. It will not be whole, it will not be healthy, it will not be sane. And so, the importance of art programs is that your society is only as good as all of your people. And, we need cutting edge, brilliant scientists, engineers, mathematicians, doctors, accountants, lawyers, whatever, but we brilliant artists- visual artists, musicians, dramatists, dancers- we need people to be able to push the limits of what it means to be human and what it means to be expressive of the human condition. It’s not like the arts are frivolous. Some of the greatest thinkers in the world have also, not just dabbled, but deeply explored the arts. Albert Einstein was a virtuoso on the streets. I don’t think physics suffered because he was a musician. I don’t think musicians have suffered because he was a scientist. I think it enhanced his brain and his cognitive ability and his influence and his life experience.